Elliot and I recently showed Worse Than Poop! at the Green Kids Festival, and to our local chapter of the Electric Auto Association. Elliot receives an award from the Green Kids Conference for his role in Worse Than Poop! The Green Kids Conference was really impressive - a massive undertaking, with two floors of information booths and activities on all things green and kid-friendly. Most impressive is the fact that the event is the brainchild of Pavan Raj Gowda, who founded Green Kids four years ago at the ripe old age of 12! Mountains of poop for the Silicon Valley Electric Auto Association! We also received a warm welcome back from the Silicon Valley chapter of the Electric Auto Association. They hosted us during our Kickstarter campaign, which many of their members supported. It was satisfying to be back to share with them the completed film! Q&A with the EV driving crowd at SVEAA. Today was a big day - in part because today I officially FINISHED Worse Than Poop! Last night, I received the last and final animation, and I just finished editing it into the final cut. I am uploading the finished film as I type! Those of you who supported our Kickstarter campaign will be receiving a download link very soon. But as anyone who isn't living under a rock will also note, today is also the Day After Election Day here in the US - and in particular, an Election Day on which almost all of the candidates and issues we were supporting got thoroughly trounced at the polls. Elliot watches Brian Schmidt interviewed on election night at KMTV. However, I am choosing to focus on the positive. One measure that did pass yesterday was Palo Alto's Measure B, which will fund some much-needed bicycle infrastructure here - including retrofitting a truly dreadful narrow cement bicycle underpass at the California Avenue train station that has tormented me and countless Palo Alto cyclists for decades. And as my friend Joylette Portlock says, no one ever got depressed into action. With the government this country just elected, we're going to need more action than ever - so I also made a donation today to the Sierra Club, and signed up to participate in a visioning exercise here in Palo Alto for 'big, bold' ideas for sustainability. And as for Worse Than Poop! - I'll be meeting next week with Carleen Cullen of Cool the Earth, to see if we can hash out a plan to get some funding for a Spanish-language version, some DVD packaging, a study guide, and a resource-rich website. We'd like to include all of these - for free - with Cool the Earth's climate kits, distributed to schools across North America. I'm also talking with some other organizations looking at the possibility of using the film for climate awareness outreach to children and families. There's plenty of work to be done - it's time to just roll up our sleeves and get busy. Today was the SF Bay Area Bike to Work Day. Elliot and I got up an hour early, to greet people at the CalTrain station. 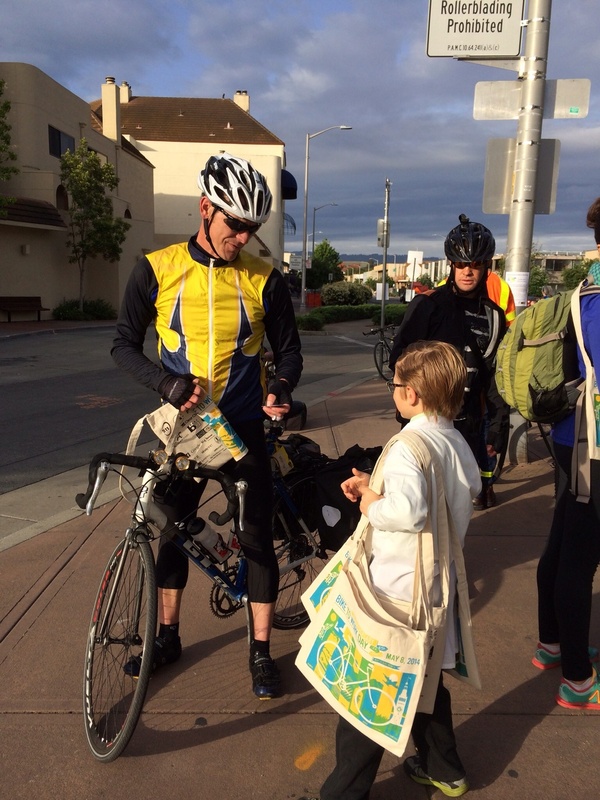 Kathy Durham, Palo Alto's Safe Routes to School/Commute coordinator, gives Elliot goodie bags to hand out. We made a giant poster and handed out flyers - along with free bagels, coffee, and goodie bags. 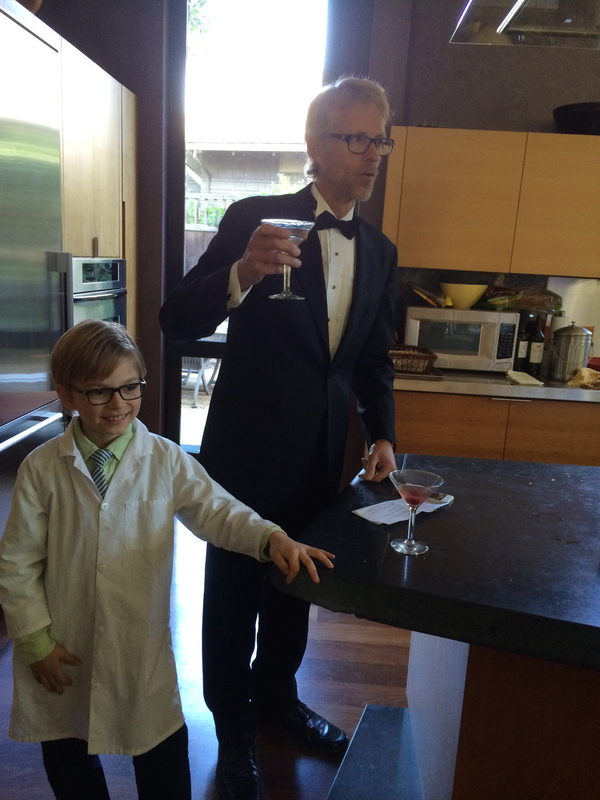 Elliot even dressed up in his professor costume. Crowd funding has made us shameless. Vanessa and Elliot, in between waves of cycle commuters. Sven Thesen at 7am, waiting for commuters and chanting "Worse Than Poop!" Towards 8am, more people started arriving - including the Mayor and the City Manager. Elliot & Vanessa with team Bike Palo Alto - including Kathy Durham, Mayor Nancy Shepherd, Chief Transportation Official Jaime Rodriguez, and City Manager Jim Keene. One cyclist, when he heard about Worse Than Poop!, asked Elliot to sign his flyer. The lucky recipient of Elliot's very first autograph. Elliot the 8-year-old climate scientist hits the 'launch' button to kick-off our crowdfunding campaign for Worse Than Poop! Sven Thesen played Master of Ceremonies. We showed the Kickstarter video, and Maddi Hausmann (EV aficionado and Leaf sales rep for Nissan Sunnyvale) interviewed Elliot about his involvement in the project. We set up a pledge station, and people cycled through, making pledges to the project. Sven and Elliot toast to launching Worse Than Poop! Towards the end of the evening, we were up to $3300, and feeling really good. Then, suddenly the amount dropped to $600. WTF?! It turned out that a lot of people didn't understand Kickstarter's double-log-in procedure - which requires backers to log in, and OUT, of both Kickstarter AND Amazon. So several people thought they were pledging, when in fact they were simply undoing someone else's pledge, and attributing it to their own account. Suffice to say, it's taken us three days to sort this out, and I'm still not sure it's completely resolved. Lesson learned! The good news is, even without all the pledges from Tuesday night entered into the system yet, we have already raised $2790, and I expect we'll be over $5000 by the weekend. So we're off to a strong start! Sandra & Drew's beautiful home filled with supporters of Worse Than Poop! And the even better news is that so many people have been coming out of the woodwork to support this project. We have 41 backers already on Kickstarter - and more every few hours. It's awkward putting yourself out there, asking everyone you know to back your film - but sometimes people really surprise you with their kindness and generosity. It sounds corny - but looking around on Tuesday night at the loving and supportive community around me, all there to help us make a difference in the world (and have some fun in the process), I felt truly blessed.